Nearly a decade on, a writer’s look at the futility of the war on drugs still matters. A military patrol on the southern edge of Ciudad Juarez. A young girl walks through a makeshift memorial, with pieces of paper marked with the names of murder victims, during a protest at the gates of a military base in Juarez in 2008. A boy at the Anexo de Vida drug rehabilitation center, where in September 2009, men armed with assault weapons murdered 10 residents. A survivor of the massacre said that the center had not received any warning or threats. A woman, surrounded by police, learns that her son has been killed. A girl grieves after her parents, who had been chatting on the street, were gunned down. A blind man begs on the walkway from Ciudad Juarez to El Paso on the Santa Fe Bridge. The windshield of the car in which federal prosecutor Jesus Martin Huerta Yedra, was killed, along with his American secretary, in December 2008. Yedra had been investigating the murder of Diario reporter Armando Rodriguez. Editor's note: Charles Bowden was one of the Borderland's most important writers. Though he passed away in 2014, his writing and observations of the war on drugs and its implications for the Southwest remain prescient. He reported this piece for High Country News in 2010. The man on the screen wears a long black veil. His voice is penetrating, his hands are strong with thick fingers. He is telling of his work, killing people for money, a trade he pursued with some success for 20 years. Another man watches the film with rapt attention. He is a fugitive from Mexico who now lives in the United States. The reason he left is simple: He had to pay a $30,000 ransom for his 1-year-old son, this on top of the $3,000 a month he was paying for simple protection. I don't ask him whom he was paying because he probably does not know. People with guns, maybe drug people or simple criminals, maybe the police or the army. People with guns inspire belief because he knows of others who failed to pay and then died. The border now is a bundle of issues: drugs, terrorists, violence spilling across, illegal aliens, free-trade economists insisting on open borders, humanitarians calling for no more deaths. On the ground, this hardly matters. The giant wall being slowly built across the southern flank of the U.S. hardly matters. In the Altar Valley south of Tucson, the wall was barely in place before gates were cut, the hinges facing the Mexican side. The man who sits on the couch and watches the killer speak on the screen is a casualty of a world being born that may not include him. Or me. Or you. Or the killer. The projections say 450 million Americans by 2050, a billion or so by 2100. And 9.3 billion people on this planet by the New Year's Eve of the 22nd century. Tell that to the wolf at your door or the national park in your heart. I am in a weak position here. I have always welcomed the illegal at my door, and beckoned the wolf. I have never reported a drug dealer to the authorities, or an illegal human being. I do not believe the state has the right to regulate what people wish to ingest, and I cannot turn my back on a poor person fleeing doom and seeking a future. The migration of the Mexican poor is the largest human movement across a border on the planet. It was triggered by the destruction of peasant agriculture at the hands of the North American Free Trade Agreement, by the corruption of the Mexican state, by the growing violence in Mexico, and exacerbated by the millions of Mexicans working illegally in the U.S. who send money home to finance their families' trips north. It should be seen as a natural shift of a species. We need ecologists on the border; the politicians have become pointless. The drug industry is the second-largest source of foreign currency in Mexico, just behind oil. It earns somewhere between $30 billion and $50 billion a year -- no one really knows, including the people in the industry. It also creates enormous numbers of jobs in the U.S.: We spend billions a year on narcs, maintain the world's largest prison industry, which is absolutely dependent on the intake of drug felons, and we have about 20,000 agents on the border who feed off drug importation. The rehab industry is also a source of a large number of jobs since many well-heeled defendants pick mandatory treatment over prison. Many county and local police departments now get fat off of RICO suits based on drug offenses. The official line of the U.S. government, one most recently voiced by Secretary of State Hillary Clinton, is that drug consumers in the United States are responsible for drug murders in Mexico. Only someone who is drugged could believe this claim. The sole source of the enormous amount of money in the drug business and the accompanying violence is the U.S. prohibition of drug use by its citizens. Since President Richard Nixon proclaimed the War on Drugs 40 years ago, there have been two notable accomplishments: Drugs are cheaper than ever, and they are of much higher quality. But then, NAFTA was promoted by presidents George H.W. Bush and Bill Clinton as something that would buoy up the Mexican economy and reduce or end illegal immigration -- two claims that now are clearly refuted by facts. The left seeks open borders or No More Deaths, the latter a protest of the 500 or so migrant deaths per year -- a rather low fatality rate, considering that at least a half-million Mexicans move illegally across the border each year. But the left seldom if ever mentions the slaughter in Mexico during the last three years that has left 17,000 citizens dead, a killing of Mexicans by Mexicans. The right constantly speaks of fortifying the border, as if this could stop a human tide lashed northward by misery. And, of course, the right promotes draconian drug laws even though the failure of such laws is increasingly apparent. On the border, Adam Smith meets magical realism. Here the market tenets of supply and demand, the basic engine of both the migration and the drug industry, are supposed to be overturned magically by a police state. Consider one simple number: The border is 1,900 miles long. If two people slipped through each mile in a 24-hour period, that would amount to 3,800 people a day. That adds up to 1,387,000 people a year. Or consider this: One bridge from Juarez to El Paso handles 600,000 semi-trucks a year. One semi with a freight load of 24 tons could probably tote enough heroin to satisfy the U.S. market for a year. Add to the mix the inevitable corruption of the police agencies: A few months ago, a Border Patrol agent in southern Arizona was busted for running dope in his official car for 500 bucks a load. Few discussions about the border come from facts. Most discussions of the border come from fears. We seem to prefer slogans and fantasies: free trade, "just say no," gigantic walls. Almost certainly, the drug industry and illegal migration are the two most successful anti-poverty initiatives in the history of the world. The drug industry has poured tens of billions of dollars annually into the hands of ill-educated and largely poor people. Illegal migration has taken people who were lucky to earn $5 a day and instantly given them jobs that pay 10 or 20 times that much. It has also financed the remittances, over $20 billion dollars shipped from immigrants in the U.S. back into the homes of Mexico's poor each year. No government can match these achievements. And tens of thousands of people in the U.S. agencies are earning far better salaries fighting drugs and the Mexican poor than they could ever make in the private sector. After, say, five years, the average Border Patrol agent is knocking down 75 grand a year, plus generous benefits and serious job security. DEA is infested with agents earning six figures. And these industries are literally failure-proof -- the more Mexicans that migrate, and the more drugs that arrive, the more agents that are hired. The real problem is not these success stories but the fact that the good times are going to end. Obviously, the terrain of the U.S. can only sustain a finite number of people. So eventually migration -- both legal and illegal -- will be curtailed by draconian national I.D. laws. As for the drug industry, the money depends on two variables: that drugs remain illegal; and that domestic suppliers, meaning the licit pharmaceutical industry, refrain from launching competing products. This second reality is already vanishing. The explosion of over-the-counter mood-altering drugs cuts into the illegal market, and bit by bit will cut into the drug traffickers' profits. Without the earnings of the drug industry, the Mexican economy would collapse. But several things will persist. The environment in the United States will continue to be wrecked as more and more people flee the failure of the global economy. Violence will flourish as human numbers increase and incomes sink. And the police state in the United States will metastasize as my fellow citizens seek magical solutions to concrete problems. Already, we have created a nation that would be unimaginable to our ancestors, one where a person often cannot work unless he or she first urinates for a laboratory. The man sitting on the couch watching the Mexican killer speak is beyond such fantasies. He is here illegally (as is the killer for that matter) and he is surviving. His old life has ended and he knows it. But then the killer's old life has ended, too; there is a contract on his head for $250,000 because he offended his superior in the drug industry. It is early January as I write. This weekend, over 40 people were murdered in Juarez, a city once hailed as the poster child of free trade, the city with the lowest unemployment rate in Mexico. The killings -- three of them women -- had little touches. A double amputee was shot in the head and then left on a dirt road wrapped in a blanket. Another man was found with his severed head on his chest -- the tongue, eyes and nose had been removed. A narco-message was left on yellow cardboard and weighted down with two severed arms. Such slaughter usually goes unnoticed in the U.S. press. Should it actually come to the attention of our newspapers, it simply will be written off as part of a cartel war. This is a fiction. Almost all the dead are poor people, not drug-enriched grandees. And though we give Mexico half a billion dollars a year to encourage its army to fight drug merchants, this alleged war has a curious feature: Almost no soldiers ever die. 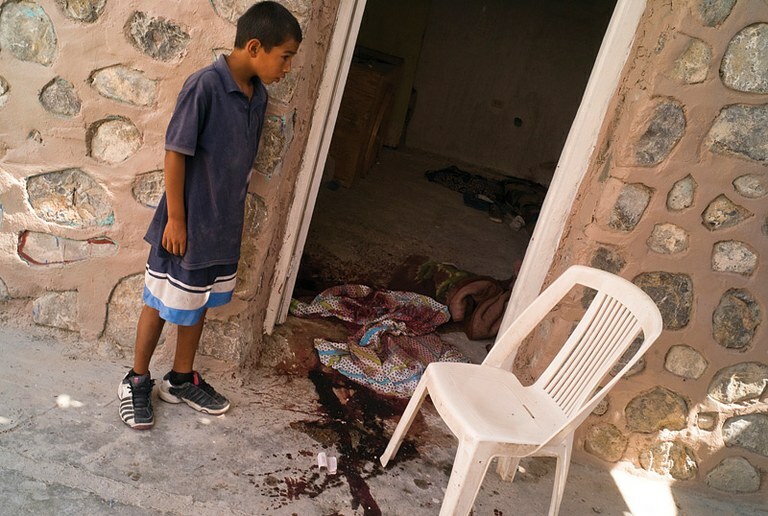 For example, in Juarez, over 4,200 citizens have been slain in two years. In the same period, with 7,000 to 10,000 soldiers in town, the military has suffered three dead. The supply and quality of drugs in the U.S. has not declined, nor has the price gone up. As for the migration of the poor, neither the border wall nor immigration raids of meatpacking plants and other businesses in the U.S. have stanched the flow. Instead, the greatest force temporarily reducing the torrent of people has been the collapse of the U.S. economy. But since the Mexican economy is sinking even faster, the migration will almost certainly resume and grow. The border should not be an issue in American life, but rather our window on the world. All our foolish beliefs are refuted here. Free trade is creating the largest human migration on earth. Our belief that drugs can be successfully outlawed has created the second-most profitable industry in Mexico and a gulag of new U.S. prisons. Our effort to fortify the border has created a wall and a standing army of agents (now larger than the U.S. army was when we launched our war against Mexico in 1846), and it has failed to stop people or kilos from moving to our towns. Our refusal to even seriously consider the notion of overpopulation (we prefer lethal drones to birth control or legalized abortion) will eventually destroy large portions of the earth's ecosystems. And we are equally reluctant to face one nagging fact about Mexico: Forty percent of its federal budget comes from oil sales, and the president of Mexico has said publicly that the oil fields will be exhausted in nine years. What then? Someday a history of our border policies will be written. It will require a Marxist -- Groucho, not Karl. Living on the border can cripple a person's emotional range. I grow more numb with each passing day. I find myself staring dazed at photographs, like a recent set from Juarez of two men burned alive. But whatever is happening to me is minor compared to what is happening to the Mexican people as their world collapses around them. One night I get a call from a friend in Juarez. He says a man just put a gun to his head and threatened to kill him. He wants me to call his wife if he turns up dead and explain what happened. I hang up and go back to reading a book. That is what the numbness feels like. Charles Bowden is the author of Murder City: Ciudad Juarez and the Global Economy's New Killing Fields (The Nation Books) among many other works. See also: A Failed State: Photographer Julian Cardona talks about the demise of Juarez. With photos by Cardona.